Video marketing can be one of the most challenging things to implement. Without the proper planning, it can eat through your marketing budget. That's why a lot of people are hesitant to try video out. However, with businesses rapidly investing more every year, it's a medium you can't afford to overlook. In fact, according to HubSpot, 81% of companies are already using video as a marketing tool, compared to only 63% in 2017. As a result, there's never been a more opportune time to start. Thankfully, a lot of marketers and business owners have already put the time in, and figured out which tactics and approaches are the most effective. In this article, we'll discuss essential video marketing tips that can ensure you create high-quality, useful videos. Before you read through and get overwhelmed with all of this advice, there are a few things to consider. First, who will create your video? A lot of companies make videos themselves, while others trust agencies or freelancers with a lot of experience. Next, you'll need to set a budget for your video production and determine how to integrate it with your current marketing efforts. Without this strategic approach, a lot of these tips will go to waste. In video marketing, planning is everything. When you have a solid plan for running your video marketing initiatives, a lot of these tips will be incredibly useful to guide you through the process. If you go with a generic video thumbnail, no one is going to watch it. A video thumbnail is the movie trailer or preview of your content, and visitors that see it will decide then and there if your video is worth watching. To provide some context to your viewer, you need to create an engaging thumbnail that includes an image and text. Tom Bilyeu, co-founder of Quest Nutrition, is an example of aesthetic to achieve with your thumbnails. He uses bold language, large text, and high-quality photography to draw attention to each asset. He also creates a custom template to follow for each of his core topics. 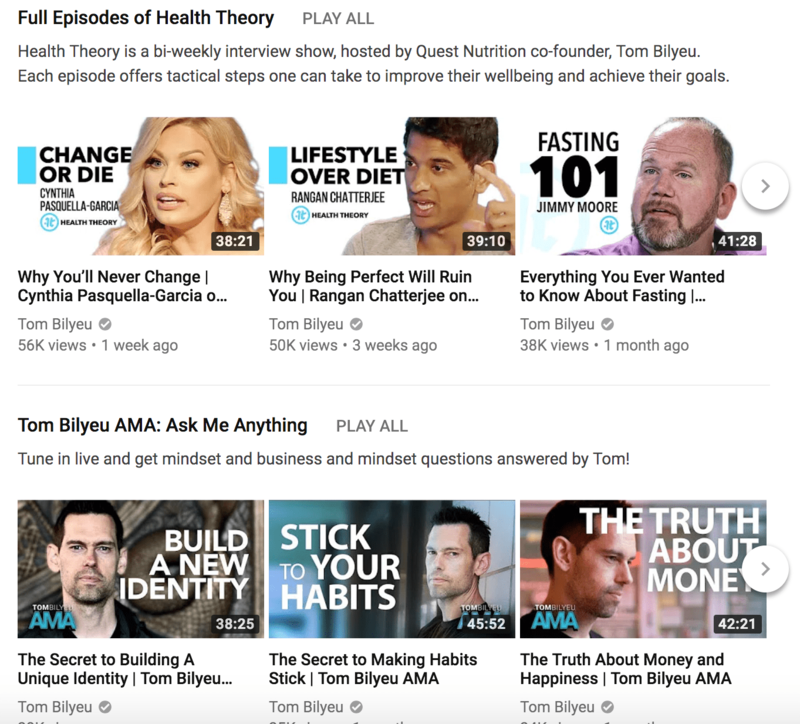 For instance, his "Health Theory" episodes use a white background and large black text, while his AMA thumbnails are an image of him, with white text and a logo. It helps to differentiate his content at a glance. To design a video thumbnail, I recommend using Canva. I like Canva because they offer free stock photography and illustration, as well as templates if you're not very design-savvy. Once you have the thumbnail, you can upload it right on your channel. Canva will save your design, and you can go back and re-use the same thumbnail layout for future videos. Keep titles under 60 characters. You should place the keyword close to the front of the title. Use exact match keywords when you can. According to HubSpot, they perform better in video rankings. Make the title short and to the point. You should communicate what the video content is, and nothing else. Determine the search intent behind your keyword. What are the reasons someone would search for that specific keyword, and what kind of content do they need to find? Add any additional information such as an episode number or branding at the end of the title. Doing a final check and see how your title appears across search and suggested videos. However, as I said, a lot of people already know these best practices. What's the difference between a headline that follows best practices, and a headline that grabs the attention of your viewer? You need to tap into your customer's curiosity. Then, over time, you can tweak and adjust your headlines based on performance. To get the most from your end screen, after you finish your video, leave at least 10 seconds of a black screen at the end. 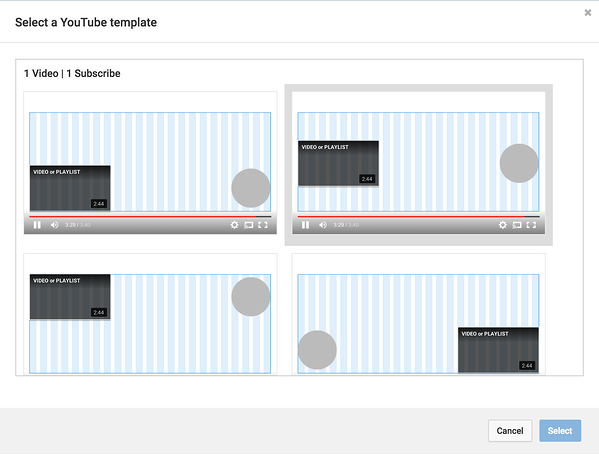 Then, after you upload your video, you adjust the end screen by going to "The End Screen & Annotations Tab," and choosing from one of YouTube's end screen templates, or the option to create one. When you first start out, I recommend using the template. 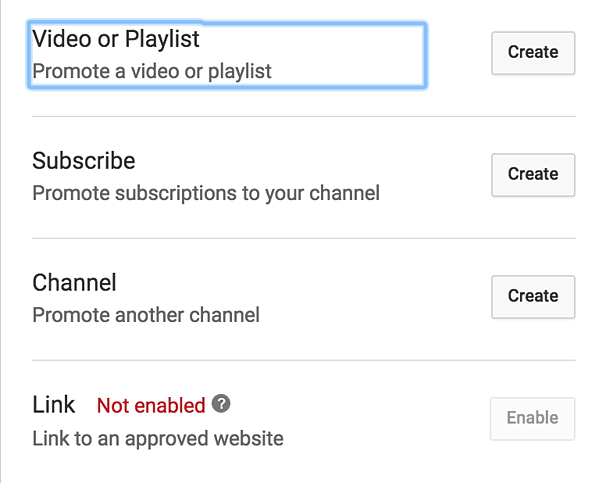 As you can see, the DIY option shows that I don't have an authorized link - which means my individual YouTube channel does not have the mandatory 1,000 subscribers and 4,000 watch hours to link externally from YouTube. Until you achieve that and officially join their YouTube Partner Program, you won't be able to feature anything aside from what YouTube offers in the template, anyway. Now, if you're not using YouTube, you will need to create an end screen. If you upload a video directly to Facebook (which I recommend if you want to build engagement on that channel), you will need to include your end screen within the editing process. You can do a frame with the URL of a landing page or conversion page, which the viewer can't click. However, if it's concise and their interest is there, they still may go to that page. For more context about the power of end screens, check out this piece from Digital Marketer. They explain in more depth about how you can optimize your end screens for the best possible performance. On any video or social media platform, you will create a title, complete the description, and select appropriate tags or categories for a video asset. The metadata ensures the video has the best possible chance of being found by your ideal customer. 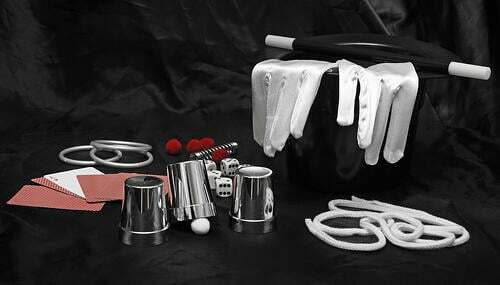 As such, you should optimize this meta-data like you would a blog post or landing page. Optimization is especially crucial when you're posting to YouTube and Facebook. After uploading your video for the first time, invest time in the optimization before pushing it live. The tags, descriptors, and title should be ready before driving traffic to it. If you spend time here, you have a better chance of your target customer finding your videos. If you skip the optimization and go back to it later, you could miss a ton of potential customers along the way. A few simple updates can be the difference between whether or not your next great customer finds your content. Without any context of what my brand does, what content can I create that will attract my target customer for the first time? What customer issues and challenges are already being addressed in videos, and are those answers the correct answers? What kind of video would help my target customer accomplish something in their day-to-day life? 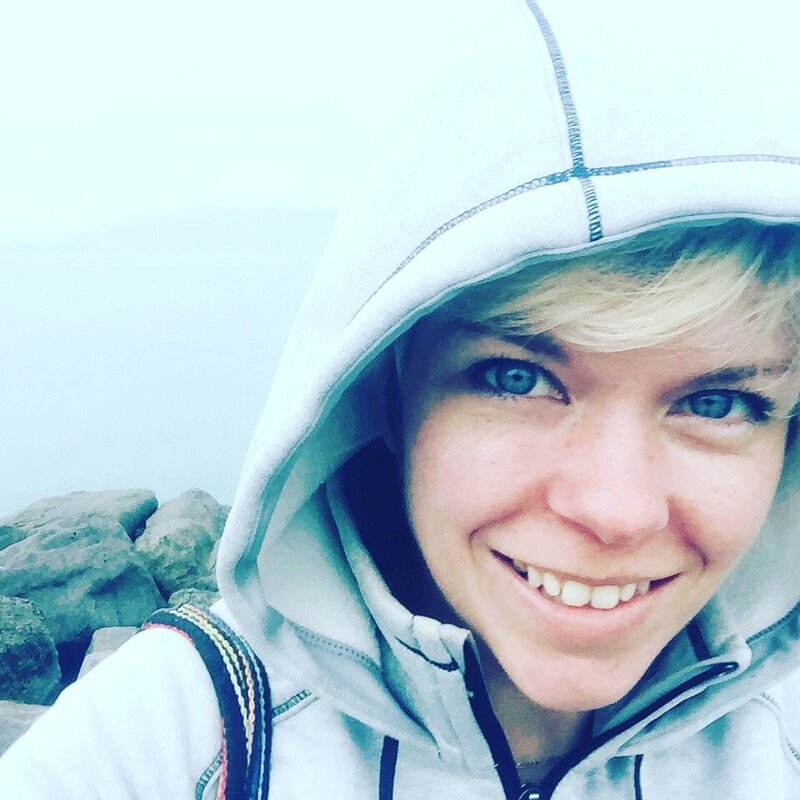 What actions does my customer need to take to get closer to their goals, and what can I do to help them do that? I never start to concept an idea until I have an answer to at least a few of those. Then, I go back to my customer research and develop a video that my customer can't afford to miss. If none of those points trigger an idea, consider creating a strategy around your UVP, or unique value proposition, which brings me to my next point. TOMS, an apparel brand, creates videos that focus on their UVP, which is "one-for-one." The brand is known for donating a pair of shoes or glasses to a person in need for every pair they sell, which demonstrates their company culture and belief in improving lives. These videos aren't about their trendy shoes, but instead, stories about their brand charity. In their TOMS One for One Giving Series, a playlist they have on YouTube, they showcase global issues they are working to help solve. The video below is an example, a story about a Cambodian woman who got surgery to restore her vision. The key takeaway? Focus on the overall problem you're working to solve. What is your unique message that places you as the leader of your segment, articulates your core sales proposition and differentiates you from the competition? Your unique value proposition can be the key to creating a one-of-a-kind video marketing strategy. One of my favorite marketing influencers is Noah Kagan because his personality is so refreshing from other marketers. His website, OKDork.com is a perfect example of how you can be a Chief Executive Officer and still have some fun. From using taco symbols instead of bullet points to the best user icon you will ever see, Kagan has a refreshing take on marketing. Here's the welcome video he features on his YouTube channel. He keeps the tone light and demonstrates a unique personality. I like that he introduces himself and explains the purpose to new visitors. The playful, personable tone carries through to the rest of his videos. The 5 Tips to Get 195,000 YouTube Views Per Month, even features Backlinko Founder Brian Dean. Dean walks through various elements of Noah's YouTube Channel, pointing out each component that helped bring in new views. I felt the video was great at inspiring me to make improvements to my channel, such as creating "power playlists," which I'll cover in my next point. The "power playlist" terminology came right from Brian Dean, and I love it. The idea is that each playlist on your channel can consist of various videos that fit into an overall narrative. Digital Marketer's YouTube channel is an excellent example of the power playlist, with one for blogging, advice from CEO Ryan Deiss, and Facebook Advertising. As soon as someone visits their page, they can see the areas that Digital Marketer has expertise in, and filter through the content accordingly. If you're creating videos for your website, you can replicate this idea on a resources page or in a video hub. The playlists you create should come from your overarching areas of focus, which you can identify in an all-encompassing content strategy. We use HubSpot's Content Strategy tool and Topic Clusters to help us identify those topics, and plan our editorial calendar around them. As a best practice, I try to create videos that tell a story without words. Otherwise, you risk losing potential customers that aren't in the right environment to watch your video with the sound. Currently, Adding captions to your videos is not just important, it’s essential. On Facebook, for instance, users watch 85% of videos without sound. You've been there. If you're on your phone, you don't always have headphones and don't want to play anything out loud. If you're at work, you may not want people to know you're watching a video. As a result, videos that perform better tend to provide captions or sub-titles or have text within the video that help guide the viewer through. YouTube and Facebook can both generate captions for you, but I've always had difficulty with their tools. It takes some getting used to, so be patient and carve out some time for this. You can also transcribe and create the captions yourself if you have a reliable editor. If you wrote a script before shooting, you could use this to streamline the process. Video marketing is not a practice you'll pick up right away. Like any other marketing effort, it takes time to find your groove. You will need to run videos on various platforms, on landing pages, and in emails to evaluate which mixes work the best. From there, you can allocate your time and budget between channels and efforts, and get more ROI from your video creation. The goal is to learn from the data. If your first video doesn't do very well, you can go back and learn from your mistakes. The most successful video marketers are persistent and do everything they can to study the preferences and behaviors of their viewers. You can track performance by channels, such as on YouTube or Facebook. If you use Wistia, reporting can be a breeze. You can track your viewers, how much of each video they watch, and which videos are the most popular with your audience. Once you decide to start with video marketing, the tips throughout this post can help inform your process and strategy. However, all of this information alone will not promise success with video. You need to structure your video marketing around your overall marketing goals. Otherwise, you'll spend a lot of time and money on videos that don't perform the way you need them to. One of our favorite ways to integrate video into an existing strategy is with repurposing the content you already have. You can turn top-performing blog posts and EBooks into videos, and use those videos throughout the buyer journey. We repurpose and reuse content all the time, and outline the process in our Repurposing Toolkit: Why & How to Repurpose Content. In the guide, you can learn how to get more ROI from all of your content, and create a cost-effective plan for getting started with video.